No business concern can deny the fact that the well being and satisfaction of employees play a huge role in the work culture of the staff which, in turn, affect the success of the business. A team of experienced facility manager is adept in boosting workplace productivity to a considerable extent. To be more precise, the roles and responsibilities played by facility managers in devising as well as maintaining the functionality of the workplace is gaining importance across all sectors today. More and more business concerns are inclining to explore the importance of facility managers and therefore, it is important to take a look in the matter. According to the British Institute of Facilities, facility management is defined as a process for maintaining and developing the organisation’s services for supporting and improving the efficiency of the primary activities undertaken by the company. Some of the primary key areas of facility management include health and safety, heating and ventilation, cleaning along with regular office management. When the facility management team is required to take care of a host processes, it means that their efficiency and adeptness play a key role in the success of any business. It is the facility managers who ensure that the business concern possess a well suited ambiance for the staff and employees where they can function without any kind of difficulties. How can facility manager improve productivity? To answer the above question, first it is important to understand why productivity lags in business organisations. In a report published by Johnson Controls, it was revealed that the amount of focused work accounts for over half of an employee’s working day. But to one’s utter surprise, it was found that about half of this span of time was unproductive. Now the question arises, why does such unfavorable phenomenon arise? The major culprits are lack of privacy and consistent presence of noise. In most business organisations, employees are compelled to work within an open and shabby environment where there is lack of peace required to get things done. Bringing in comfort: When a team of expert facility managers is employed in such a scenario, they make sure that there is room for flexibility for a variety of working styles. When the staff and employees are equipped with proper furnishing from couch to desks to quiet places where they can contemplate on any matter, they will be able to focus on the project at hand with much dexterity. When the employees get a feeling that they are able to control their working ambiance, they can devote more time to the welfare of the organisation they work in. Collecting data: When a business does not have the requisite data and information for identifying the process which is not working, the whole system will remain jeopardized. Facility managers bring in the required software solutions for collecting data pertaining to growth of revenue, facility costs, utilization of space and several others which have a direct connection with employee productivity. Enabling change: Though the facility managers are not able to deliver productivity, they play a huge role in delivering it across business firms. An experienced facility manager understands that not all business organisations are the same and thus, they work as a part of the whole team. They look for space for changes and facilitate them in order to give the business a boost that it desires. For instance, if there is disturbing noise all over the working area of an office, a facility manager may recommend covering the computer printers with shields and it can reduce the noise by 90 percent and improve concentration levels. Though it is not obvious in all cases, yet there is often scope for reassessment of the office layout from the perspective of workflow for the provision of effective ergonomic furnishing. Allowing break time: Though a facility manager is not in charge of passing mandates of a break time, they can actually incentivize taking breaks. This is because taking a break from the mundane of regular work can assist in recharging the employee and keep him going all through the day. According to facility managers, inclusion of small perks allow the employees to be more social and relaxed with the co-workers. Organizing the workplace: Although it might sound to be an absolute necessity, some companies do not realise how to go about it. A responsible team of facility manager can help in improving the appearance of a disorganised and messy place. It is often found that organisation within the workplace is highly sacrificed. It is not possible for the business authorities to realize that the amount of mess is directly proportional to the level of stress. The facility managers recommend having proper places for keeping their stuff and documents which is also effective in keeping the workplace more comfortable. Decluttering is the key: Minimalism is quite refreshing for any office setting but the facility managers recommend that one should not go overboard with it as it might turn the entire area into a barren space. In order to surge the productivity scales, it is a brilliant idea to include plants. This is because it helps in improving the cognitive, physical and emotional involvement within the workplace and it is useful in increasing the productivity and satisfaction of the workers. The facility manager is able to optimize the working environment in such a way that the mental and physical performance of the employees are increased to a substantial extent. They also take care of basic requirements of the staff such as offering access to food and beverages, medical necessities and promoting overall well being. 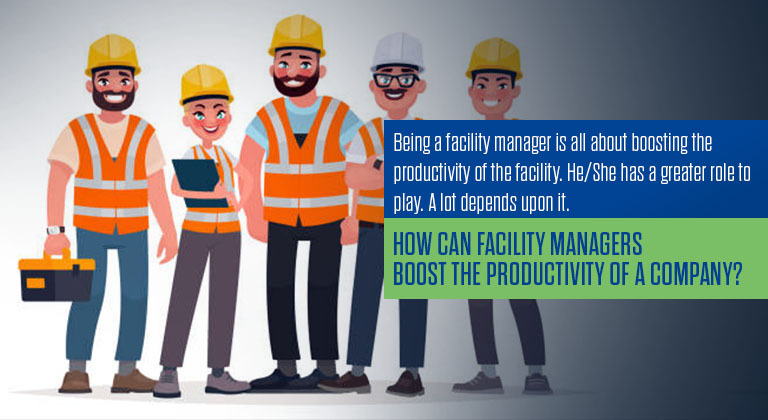 The most significant role played by the facility managers within an office setting lies in educating the responsible authorities for creation of the right facilities so that the employees can become happy and contribute to an overwhelming success of the business concern. When the business authority invests in their people, the latter is bound to be productive.